DTS-HD Master Audio™ is a high definition audio format that delivers superior audio quality while conserving file size and bandwidth. This audio quality and small file size is delivered thanks to a variable bit-rate technology and its non-redundant structure. 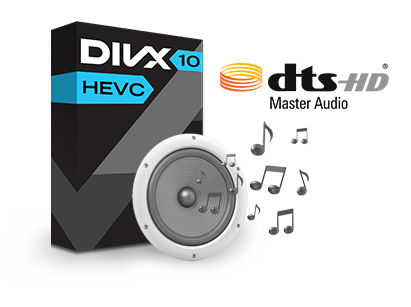 The DTS-HD Plug-in for DivX Software allows you to convert and play DivX videos with DTS audio tracks for studio-quality sound, including HEVC up to 4K. Whether enjoying entertainment at home or on the go, DTS aims to provide the finest audio experience possible no matter what device you are using.